Gabrielle de Pooter went to London to speak about MoMu’s experience with creating open access to its collections. Photo: Gabrielle de Pooter. CC-BY-SA 2.0. 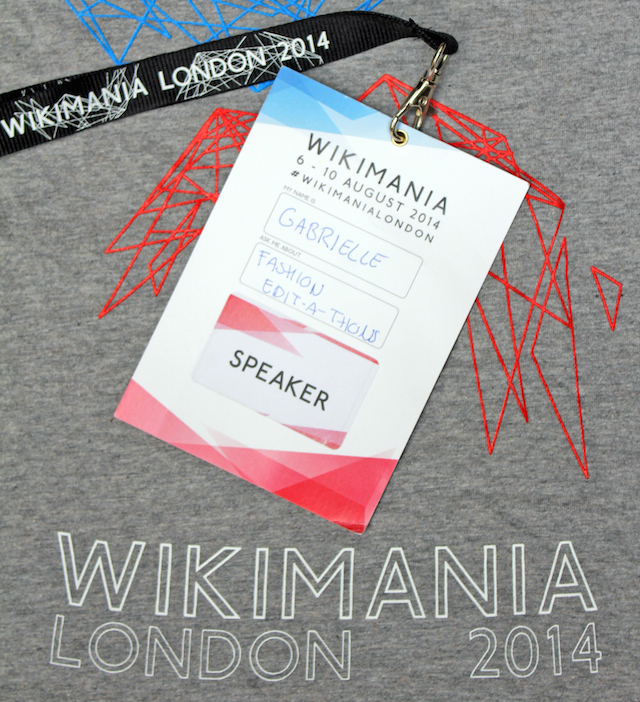 Last week, MoMu was represented at the annual Wikimedia conference at The Barbican in London. Wikimedia is dedicated to making knowledge and media freely available for everyone and therefore works closely with museums, like MoMu, asking them to make their collections available online so people can see, learn and get creative with the collections. MoMu is strongly committed to giving people access to its collections online. The MoMu collection can be browsed via Open Fashion and there are 10.000s of MoMu objects in the online fashion portal Europeana Fashion. MoMu has also made first steps to make images of the collection available on Wikimedia so people can illustrate their fashion articles on Wikipedia. Last year, MoMu organised an edit-a-thon, inviting people to use the images of the collection to write articles about fashion on Wikipedia. This edit-a-thon was one in a series of edit-a-thons at fashion institutions around Europe coordinated by Europeana Fashion. Organising this edit-a-thon and being part of Europeana Fashion is an on-going and instructive process for the museum to explore the best ways of opening up the collection online. Naturally, MoMu was glad to share and exchange its experiences with other museums and the Wikimedia community from all over the world during a panel especially dedicated to the topic of enhancing open access to digital fashion content. Other participants in the panel were representatives from the Netherlands Institute for Sound & Vision, Israel Museum in Jerusalem, Wikimedia Sweden, Wikimedia Italy and Wikimedia Israel. This entry was written by Gabrielle De Pooter, posted on August 14, 2014 at 10:50, filed under Europeana fashion. Bookmark the permalink. Follow any comments here with the RSS feed for this post. Both comments and trackbacks are currently closed.